Now more than ever people need to try to understand one another. That is what Miriam Garfinkle believes in the aftermath of September 11 and why she feels it is even more important for people to come out and view the Middle East Peace Quilt when it comes to North York today, Sunday. “After September 11, when there has been much tension between people, this is a way of bringing people together,” she said. Sima Elizabeth Shefrin, the fabric artist behind the quilt, agrees with Garfinkle. 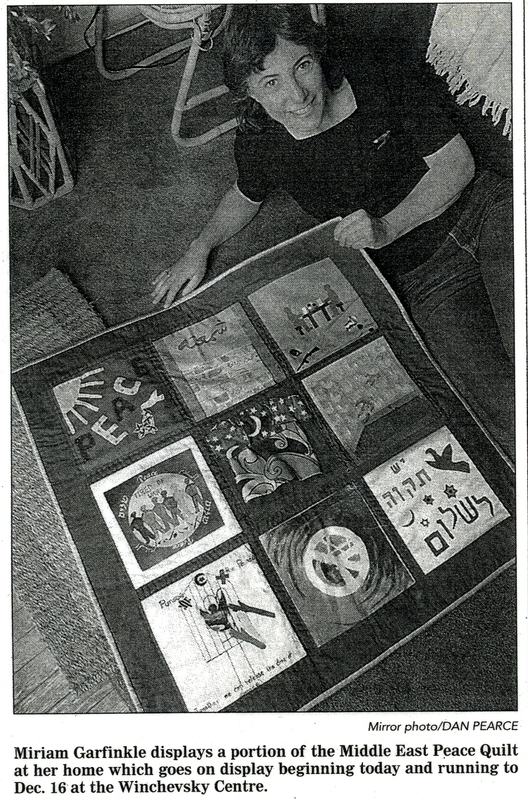 The quilt, actually 30 separate quilts, depicts personal visions of peace between Jews and Palestinians. It will be on display at the Winchevsky Centre from November 25 to December 16 . Shefrin will be at the opening on November 25, which starts at 2 p.m.
Garfinkle began the effort to bring the quilt to Toronto in the spring, after she met Shefrin in Vancouver. In doing the research for the course, Shefrin said, she realized how much influence fabric projects like this have in educating people about issues and leading to change. She started the project in 1998 as a way to bring people together. The quilt was created by 300 people of different cultures from North America and Europe. A personal statement from each creator accompanies each square. Shefrin said some of the statements suggest political solutions, while others talk about the creator’s family or personal experiences. The quilt is finished but Shefrin still receives pieces in the mail and she sews them together when she has the time. The quilt being the product of so many different people is what Garfinkle believes makes it so special. Garfinkle also hopes it will foster dialogue. In bringing the quilt to Toronto she found herself talking to people she might never have. She formed a committee and the committee contacted different Jewish and Arab groups that ended up co-sponsoring the event, including the United Jewish People‣s Order. This dialogue is part of what Shefrin was trying to accomplish. “When I see Jewish and Arab or Jewish and Muslim and Christian organizations working together to display the quilt I’m very pleased,” she said. The Arts Council of Toronto also helped make this showing possible by giving the committee a grant. Garfinkle hopes a lot of school groups will come to see the quilt because the future is in the hands of young people, she said. The quilt is open to public viewing on Sundays from 1 to 4 p.m. or by appointment. Admission is free but they are asking for donations. The Winchevsky Centre is located at 585 Cranbrooke Ave. at Lawrence Avenue and Bathurst Street. The quilt has also been on display in Vancouver, San Francisco and many other cities across North America. It arrived in Toronto from Fredericton, New Brunswick.